Due to licensing, we cannot display the app. Building a Music Discovery Service brings together such technical concepts as consuming APIs, rendering audio in the browser, and transforming images. The Music Discovery Service combines them all as a music-player app in which you can browse through a list of artists, search for artists, pick an artist's album, view all the tracks in the selected album, and play songs from there. This guide walks you through the process of building a Music Discovery Service and highlights its key features. Since the Browse page is also the home page; we must define its route such that those artists with names that start with a certain letter populate the page whenever someone visits the root route. In other words, define the routes for the Browse component to match that requirement. The route also redirects the visitor to the /browse/a route. That syntax means that the browse route takes a parameter, which is the letter of the alphabet, in this case a. To display a list of the artists returned from the server, we need a list component for holding the individual data for the artists. That component also needs helper functions. To accomplish all that, we create a separate utility file and then import the file into the component. In the utility file, we declare and export the base API’s URL for our project and the letters of the alphabet. The file contains a goTo function for navigation. Additionally, the file defines the query parameters for that particular route with the route name. The file also contains a normalizeTitle function that takes in a title string as a parameter, replacing all the spaces and forward slashes in title with -. Next, we feed data to the BrowserList component for display. How to get that data? From the API. Because we’ve already defined the API with the helper function in the utility file, all we need to do is update the Browser component to make a request to the API and then feed that data to BrowserList. We now paginate the data returned from the server because we can’t display everything on one page. Also, at this point, only the the artists whose first names start with the alphabet a are displayed. We must find a way to filter through the rest of the alphabet. Thankfully, Vuetify contains a pagination component, which, along with an alphabetic filter, we then add to the Browsercomponent. Also, in the BrowserList component, we add an event listener to listen for a page change and an alphabet filter.. For each letter, when a click event is triggered, the goTo method is called, which navigates the audience to the selected letter filter. 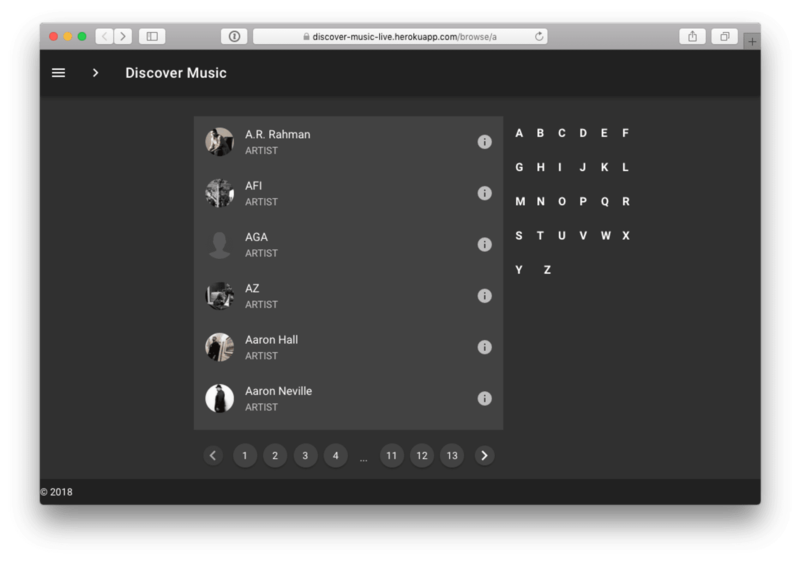 Now we need a way to enable the audience to search for their favorite artist. You might say, "Oh if they know the artist’s name, they can simply use the alphabet filter." Well, what if they don't? What if there were a hundred artists with the same name? Adding a search capability would greatly improve the app’s user experience. We've already added a search field to the UI. Now let’s make it search for artists based on an entry. The cl function we imported from the utility file is from the Cloudinary library. With Cloudinary, the media-management platform for web and mobile developers, we can transform the images on the carousel as seen in the transformCoverImage method. . Finally, reference the newly-created carousel component on the Browse page. That component is displayed right above the search field. When the audience clicks an artist name on the Browse page, they’d expect to see a list of the artist’s featured albums. For that to happen, we create a separate component that serves as the album page. We then click an artist name on the Browse page to see what should be on that album list. For now, only breadcrumbs are displayed; let’s generate an album list. The album list is now all set, showing the albums on the Album page. As a nice touch, show the artist’s image on the Album page. Finally, we build a page on which the songs in the album are played on demand We do that by creating a component called Player, which handles the listing of tracks on an album and which also holds the player. That player is a component that controls the music the audience will be listening to: play, stop, shuffle, and so forth. We used Cloudinary to transform the banner images in the transformAlbumAvatarImage and transformArtistBannerImage methods. Next, we update the player component to fetch the tracks from the server. Even though the Player page is now done, we have yet to play any music there. To set up a player on the page, we leverage the vue-aplayer library, which contains a player component with controls for play, stop, shuffle, forward, and other tasks. To make use of player, we load the album’s track list on it and then update the Player.vue file. A neat feature would be to enable the audience to share the track they are listening to. The vue-social-sharing library makes creating social-sharing links a breeze. Simply feed the information about the current playing track into the component and it will generate a sharing link. Register the social-sharing library as an external plugin for the app. Open the Player.vue file and update it to include the social-sharing links for the player. That’s it. Simple as ABC. You’ve just learned how to build a music player with VueJs. In the process, you’re acquainted with concepts like image transformations with Cloudinary, fetching and displaying data from an API, and making use of external plugins. Let us know if you have any questions in comments.